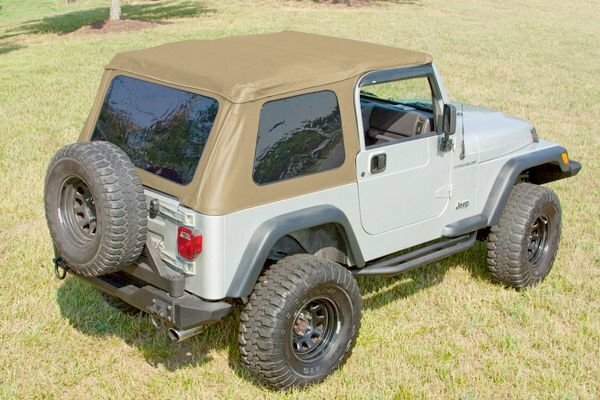 The Bowless Top from Rugged Ridge® is the most versatile Jeep® soft top of the market. It allows you to convert instantly from a full top to a summer brief, and eliminates the need for the bulky OE soft top frame. The Bowless Top fits snugly over the factory roll bar for a more aerodynamic fastback look, but retains your factory door surrounds and tailgate bar to provide an air tight fit. Convert to a summer brief by simply unzipping the side windows and stowing them in the rear window storage fold designed into the top. The Bowless top is made to the same specifications as the factory replacement tops and features: reinforced stitching on the heavy pull areas, as well as heavy duty 30 mil thick DOT approved 31% tint window glass, durable vinyl coated polyester and cotton fabric, and all sewn seams use marine grade thread to make sure it does not deteriorate or discolor in the sun. NEW design is less complex and easier to install than competitive brand tops. Custom design fits better using significantly fewer straps and no center bow. This bowless top uses only two Velcro side straps, one center adjusting strap and two rear straps making a better fitting, easier to install top. All straps are inside the top making for a cleaner better looking design. Rear window either rolls up or can be used as the storage flap for side windows. No extra pockets or complicated securing device to store your rear quarter windows. Side weather protecting foam is attached to the top. Competitive brands have this foam separate from the top creating a potential missing part. Each Top includes a pair of handy zippered side pocket for map and accessory storage. Side design includes a handy installation pull tab for ease of installation. Notorious leak spots behind the doors have been covered with a special rain flap; keeps the weather out! Backed by an industry leading three year limited warranty. Most soft top warranties are only 1-2 years!